As well as being released with the scats, a secretion from the cloacal glands is often produced when a wombat rubs its rump against a tree or an overhanging branch. It is produced as a brownish liquid, and it carries a very strong 'wombat' smell. This smell is also very noticeable when, after depositing its scats, a wombat sometimes deliberately rubs its cloacal region back and forth over the scats. 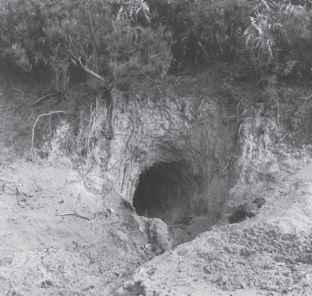 A trail of brown drops is also often secreted as a wombat enters or leaves a burrow and as it moves about its home range. I have not seen wombats show flehmen in response to this secretion, but it does appear that they can follow a scent trail unerringly, even when it is several days old. I have collected the brown liquid from a polished wooden floor, where it was often deposited by wombats visiting the house, and used it to create a 'wombat trail' by placing drops of it at half-metre intervals for 25 metres across a clearing in the forest where there were no district game tracks, incorporating two sharp bends into my trail. When a 15-month-old hand-reared female, walking at my heels, was led past one end of this trail, she immediately turned away from me and followed the trail and its bends, sniffing the ground as she went and stopping less than a metre past the end of my test trail. She then returned to me, still sniffing the ground along the trail. On another occasion about three months later, this female located a burrow she had not previously visited, apparently by following a scent trail for about 100 metres. She sniffed the ground frequently and became quite agitated when she seemed to temporarily lose the scent. When she reached the burrow and entered it, I heard chikkering sounds coming from inside, and the female emerged after only a couple of minutes. An adult male was later seen leaving this burrow, and I assumed it was his scent trail that she had followed. Ken Green studied bare-nosed wombats' movements in the Snowy Mountains by following their tracks in the snow. He noticed that the wombats found their way by scent marking, with one step in four having a drop of scent visible in fresh snow.